Germaine Ribière was about 23 in 1940, when Germany speedily defeated the French army. In the wake, General Petatin assumed leadership over the Vichy government. He won the loyalty of many French Catholics, including Church leaders, by restoring many historical privileges to the Church. He spoke in traditional Catholic imagery, referring to France as the “eldest daughter of the Church” and spoke about the possibility for renewal in Vichy France. For two years, the hierarchy supported Vichy without question. Germaine Ribière was not so easily deceived. In May of 1941, Germaine began to be concerned about the action that the Vichy government was taking against the Jews. The Germans began rounding up Jews in Paris, and she recounts in her diary, with great pain, at the agony that the Jews were suffering. 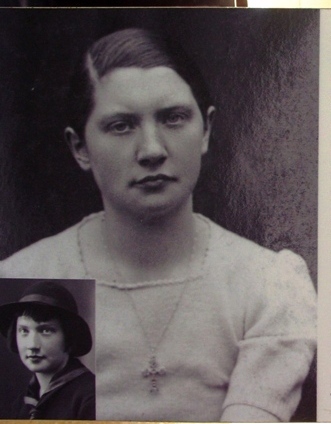 A student in Paris at the time, her roommate Marie recounted the horrors of the first deportation of Jews. Germaine agreed with Marie that they had a Christian duty to speak out against the atrocities. A member of the Christian Student Movement, she went to her chapter’s chaplain. She told him that the student movement must speak out against the Nazis. The chaplain was also the secretary of the archdiocese and would later be ordained a bishop. She wanted him to speak out in favor of a vigil Germaine was planning to host with Marie at the next meaning. The priest, Father Lallier responded, “I admire your charity Mademoiselle, it is truly admirable. Yes, there is a Jewish problem; there is also the problem of Alsace. But please, understand, we too have a problem-our schools.” (He feared the Catholic schools would lose government subsidies if they spoke out in favor of the Jews.) Germaine resigned from the organization that very night. Germaine traveled throughout France with the Resistance, trying to find hiding places for Jewish children in convents and homes. At times, her association with the Jews was met with hostility from the clergy. One priest, upon hearing that she had been helping Jews, refused to give her communion. Despite this hostility, Germaine never grew bitter toward the Church or the clergy. Instead, she simply mourned for the prevalence of human sin within the world. Eventually, the clergy in France began to join the Resistance movement and take a more active role in opposing the Nazis. She joined with priests such as Fr. Roger Braun, Fr. Pierre Challiet, and Bishop Jules Saliege in efforts to take children out of occupied France and to safe houses in Vichy. At one point, the Gestapo laid a trap for Jews seeking out forged papers. Germaine, at great risk to herself, disguised herself as a cleaning woman so that she could warn Jews of the trap. After the war, she worked to return Jewish children to surviving relatives. At times, this was risky. Two Jewish orphans had been smuggled out of France and hidden in a convent in Spain. Germaine sought them out, rescued them from the convent, and delivered them to a surviving relative. In 1957, Germaine was honored by YadVashem as one of the Righteous among the Nations for her work in France.